Serving up a super trendy slice of clothing, accessories, vintage, gifts and bric-a-brac stores, Newtown’s eclectic essence is certainly emulated via the abundance of boutiques that line King Street and sleep in the side laneways of this electric Sydney suburb. Cool and curated, Maple Store is the go-to for entire outfits. This store, which specialises in denim and lifestyle products from a breadth of international on-trend brands is all about what’s going on right now. Whereas some stores stock fast fashion, Maple Store approaches fashion in a holistic manner. This is not a label, it’s a lifestyle. Cream has quickly become the household name in Sydney for being the place to go for vintage, pre-loved or re-modified threads. With three stores, Cream on King, Cream on Crown and Cream on Hunter, this institution has spread its wings, spanning the breadth of Sydney. Endless racks of the coolest retro-printed tees, slick leather bomber jackets, bejewelled 1920s dresses and Levi’s mom jeans to lust after — you’ll find it here. The Social Outfit is a sustainable fashion and lifestyle brand leading with its flagship store in Newtown. With an ethical business model, The Social Outfit is all about empowering new refugees and migrants with training, opportunities and employment in the fashion industry. This registered charity’s goal is simple: provide financial independence to their team of culturally diverse individuals whilst offering customers ethical and sustainable fashion rich in story and design. 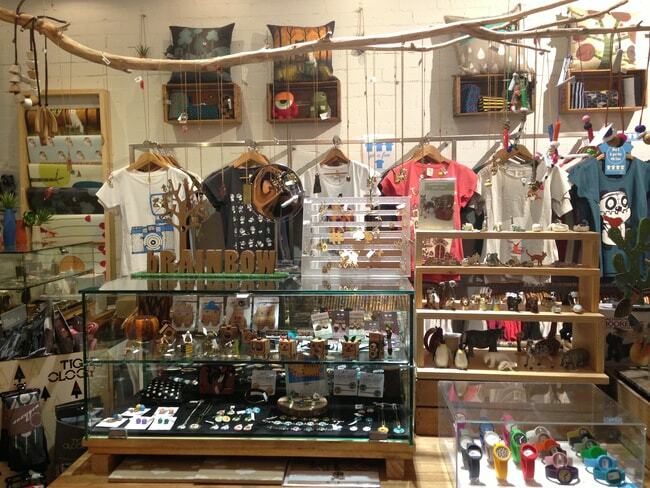 This socially responsible fashion and lifestyle store is one of Newtown’s go-to’s for giving and indulging alike. Launched over two decades ago, Tree of Life commits to doing its best to ensure safe and fair conditions for all of its manufacturers. The company also gives back to the countries in which its products are produced, the premiere focus being children’s education and health. With the subtle ease of an endless summer, Tree of Life nails bohemian bliss effortlessly, conjuring memories of faraway travels, beachside bonfires, balmy nights barefoot and sand between your toes. Founded over a decade ago, this Newtown staple on the fashion scene is the combined effect of wearable and on trend. Imagined by Australian designer Danielle Atkinson, Milk & Thistle features minimal contemporary clothing and presents a curated selection of local and international labels complementing the aesthetic of the store, such as watch brand The Horse and homeware brand Sands Made. Labelling itself as an ‘art-infused gift store’ Monster Threads most certainly meets the mind’s imagination. Think eccentric bits and bobs with a playful artistic charm; painted plates, printed tees, graphic umbrellas, jewellery, accessories, homewares and toys. Launched as a small Sydney weekend markets brand, Monster Threads now has six stores across Australia. Launched in 2006, this concept streetwear store has expanded to eight brick-and-mortar stores across the continent, with each still boasting the same mission: unbeatable customer service and the most edgy, on-trend threads on the scene right now. In a bid to dodge mass saturation and production, Bronze Snake only carries limited pieces of each item. It also offers free next-day delivery from its online store, no matter the spend.